size: 15.5 x 23.2 ซ.ม. This is just one of the rave reviews from readers of Inc., the fastest-growing business magazine. By delivering the best practical advice and most inspiring stories to entrepreneurs, owners, and managers of small and growing business, Inc. Wins its way into millions of hands each month. Now, the best of these articles have been gathered together in The Best of Inc. Series. Only Inc. Bring you both inspiration and practical guidelines from experienced, successful journalists and CEOs. The Best of Inc. 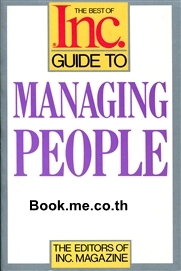 Guides are the essential resource for managers and owners on the move.